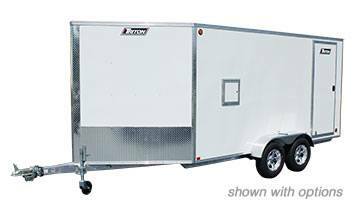 Our XT line of enclosed aluminum trailers is designed with quality materials to ensure you receive the easiest-to-use snowmobile trailer experience. With features like a large, 5’ V-nose and front ramp door, you can be sure every detail has been crafted to meet the unique needs of snowmobile hauling. Take a look at some additional features below, and be sure to request a quote from your dealer when you find the model you’re looking for. Quality 2 in. coupler with steel safety chains and spring loaded clips for ease of use, strength and safety when you need it the most. US DOT and Transport Canada compliant sealed LED marker lights and stop, turn, and tail lights. Two interior LED dome lights for bright, consistent illumination. Swivel wheel tongue jack makes it easier to move the trailer off the hitch while keeping the tongue off the ground. Custom engineered aluminum extrusions provide a higher level of fit and finish. Custom molded wiring harness, routed through the cove and trailer frame with 12V automatic breakers inside. Treated Marine Grade 5/8 in. plywood decking w/limited lifetime warranty ensures maximum enjoyment and value. Rear - 70 in. up to 76 in.